Radial head fractures represent the most common fracture of the elbow. They account for approximately one-third of all elbow fractures, and have highest incidence in those between 20-60 years of age (with a slightly higher frequency in females). In this article, we will look at the pathophysiology, clinical features, investigations and management of radial head fractures. At the elbow, the radial head articulates with the capitulum of the humerus and the proximal ulna. This arrangement allows for flexion/extension and supination/pronation of the elbow. Radial head fractures typically occur via indirect trauma; with axial loading of the forearm causing the radial head to be pushed against the capitulum of the humerus. This most commonly occurs with the arm in extension and pronation. There are complex ligament structures that can also be damaged in these injuries, which may need further clinical/imaging assessment. Radial head fractures often present with a history of falling on an outstretched hand followed by elbow pain. The patient may report variable degrees of swelling and bruising at the elbow. On examination, there may be tenderness on palpation over the lateral aspect of elbow and radial head, with pain and crepitation on supination and pronation. Other clinical features include elbow effusion or limited supination and pronation movements. *An Essex-Lopresti fracture describes a fracture of the radial head with disruption of the distal radio-ulnar joint, and will always require surgical intervention. All patients presenting with suspected radial head fractures require routine blood tests, including a clotting screen and a Group and Save. Plain AP and lateral radiographs of the elbow are recommended as initial imaging. This should including the joints above and below if their involvement is suspected. Radial head fractures can be easily missed on plain radiographs and occasionally only an elbow effusion may be seen. 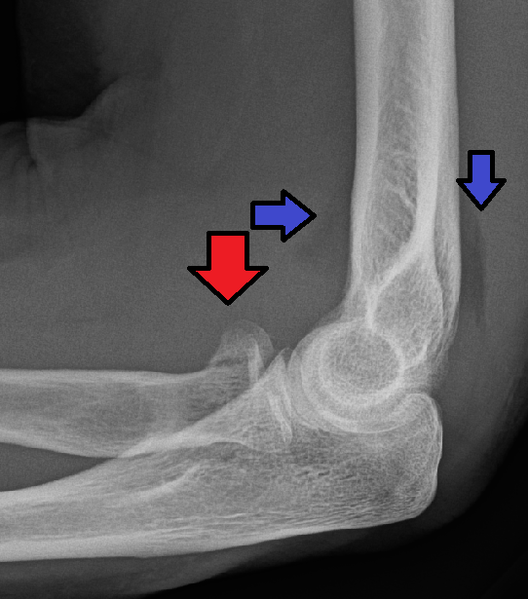 Elbow effusions on a lateral projection is termed a “Sail sign”, shown as an elevation of the anterior fat pad, in keeping with an occult fracture. CT imaging can be useful in evaluating more complex injuries and degree of comminution. MRI imaging can be used to assess suspected associated ligament injuries. Mason Type 1 – Non-displaced or minimally displaced fracture (<2mm). Mason Type 2 – Partial articular fracture with displacement >2mm or angulation. Mason Type 3 – Comminuted fracture and displacement (a complete articular fracture).